A network time stamp, providing automatic time synchronization for validated time. 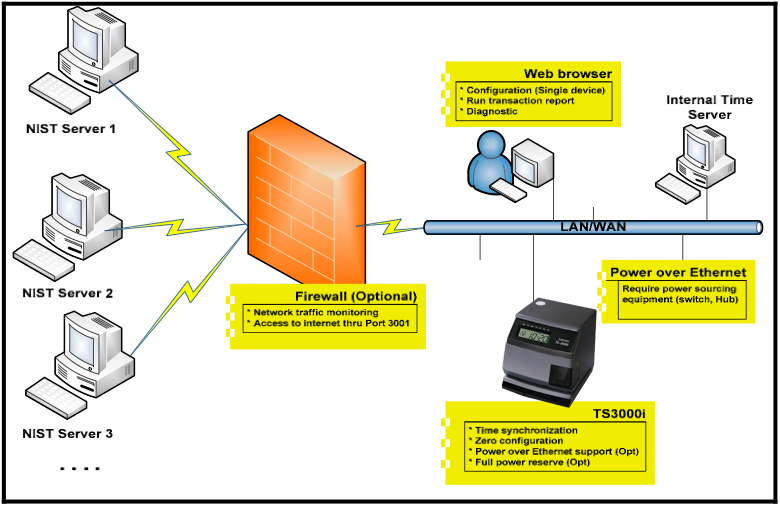 The Amano TS-3000i (ASTC3000POE and ASTC3000) OATS Compliant Time Stamp can be configured using a standard web browser, providing a standalone solution with no back-end infrastructure nor connection to business-critical workstations. An ideal, cost-effective solution for small brokerage offiices that require a low quantity of time stamps with minimal setup. Configure for use with ATVS Software installed on a network server for central management of the deployment over your network (ideal solution for larger deployments from one HQ office up to firms with hundreds of branch offices requiring management of as many devices as necessary). In other words, for any size deployment, up to 10,000 units, the TS-3000i is the solution for your needs. The most cost-effective, easiest to support, highest quality and the ultimate technology - the TS-3000i is the new standard in OATS Compliant Time Stamps. The TS-3000i is a true 10/100 auto-negotiating network time stamp that provides users with automatic time synchronization for validated time. This clock will operate as a standalone device on your network, employing easy-to-use time synchronization schedules. Send email and/or SNMP trap alerts for failures and perform backups to maintain external records for compliance. The clock also generates reports on time sync events for use during an audit. ATVS Software for central management, monitoring, support and record maintenance, of any quantities of Amano TS-3000i, PIX-3000xN, PIX3000xNT time stamps. 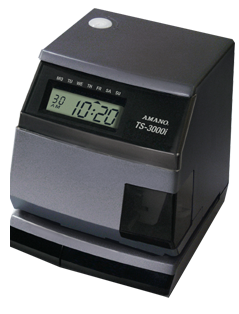 Over 300 financial firms nationwide have thousands of Amano OATS Compliant Time Stamps in use that Central Time Clock implemented and who now fully supports and services. Let us show you how the TS-3000i can be seamlessly integrated into any existing/previous platform by Amano. Trade-ins offered for other manufacturers solutions as well. Thank you! We have received your message. An email has been sent to address provided. If you do not receive an email, please refill the form by refreshing page, or call (718) 784-4900 to discuss.